Our latest installment of Holiday PR Prep got down, dirty, and detailed when it comes to creating and executing your holiday pitches. Whether you missed it or simply want to watch it again, you can instantly do that at anytime via this page, which contains the replay video as well as the Companion Guide and three simple, sample pitch scripts you can make your own. This class was packed with strategic information, templates, #SwipeThis scripts of actual holiday pitches you can model your own after, and advice on how to handle the follow up after you press “send” on your holiday emails. Listening to the replay also means you can hear the real-time questions from our “digital studio audience” and my answers – chances are they’re similar to the questions you may have as well! The full outline of the class along with the Companion Guide and pitch scripts are available beneath the class video! Can’t wait to hear what you learned and loved – and see you turning your assignments into PR action! DON’T FORGET to tweet/Instagram yourself in action learning or executing your game plan and tag it with #HolidayPRPrep and my handle (@sabinaknows) for a chance to have a private PR Power Call with me! The five things you must do before pressing send on a holiday pitch email – or any pitch! How to pitch the press if you’re currently feeling shy, anxious, or frozen. What to do if you’re still not sure what members of the press are the best fit for your product or expertise. How to execute pitching the press like a pro: What days and what time are best, what kind of communication are they looking for emails or phone calls, and anything else you want to ask about execution during the live class! We’ll discuss the anatomy a perfect pitch, and you’ll receive a template and three sample scripts for your holiday pitch and follow up. An introduction to following up on your pitches the right way. How to ensure that you’re not just pitching for holiday but actually growing long-term relationships with the people you’re emailing. What not to do when trying to get into a holiday gift guide or holiday press. Audience questions answered live during class! 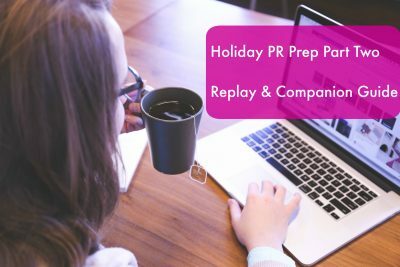 Sign up for Holiday PR Prep Part Three HERE! We’ll be talking about what to do when you get a yes, no, or silence when you’re pitching, how to leverage your holiday magazine press into even more sales, and what you need to do to turn the press you’re pitching into long-term media relationships! Not sure if you can make it? Sign up anyways and you’ll score the replay – we don’t want you to miss a thing! Did you miss Part One of Holiday PR Prep when we talked about what you need to create before pitching and gave you the “how to” to finding the write press targets and media contacts? You don’t have to feel alone in your DIY PR journey! My private Facebook community, Press for Success, is packed with entrepreneurs and small business owners like you who are sharing their ideas, passions, businesses, fears, celebrations and more. Join us today!